This Double layer High Absorbency fabric is super soft and made of super thin fibers. It is used in cleaning delicate surfaces such as space telescopes. The fabric is woven to be non-shedding. Its high absorbency capacity makes it ideal for the surface cleaning of delicates optics. The fabric has also a unique folding design that creates a softer edge compared to a hot sealing process. 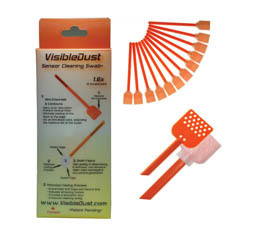 Compatible with VDust Plus™ and Smear Away™. The specially developed mini-channel design provides an even saturation of the paddles surface while preventing pooling and vertical flow at the edge. This reduces streaks associated with traditional flat surface paddles. The mini-channels also provide the extra reservoir to absorb the excessive liquid and prolonging the moisture life of the swab during the cleaning process.